I’m not usually one to be a watchin’ that movin’ picture box, but the other day my Lady gots a movie for us to watch. She popped us up some of that puffy corn we all like and we settled in to enjoy the show. To be honest with ya, we usually snooze our way through after the popcorn’s gone cause her movies are usually sappy movies on Lifetime WOOF! This one was called Susie’s Hope and I thought “here we go again”. But, this one was different! Susie’s Hope had a pup in it! That made me sit up and take notice! My Lady ‘splained to us this movie was about a lady and a badly mistreated dog and how they went on to do somethin’ mighty important. That sure got my attention! I gots a special feelin’ for mistreated pups, seein’ as to how I use to be one ‘fore I found my Lady. I reckon my Lady has a soft spot for em too ’cause all of us here has a story to tell. Anyway, I figured I better get up there and claim my spot beside my Lady to snuggle in beside her. I made a bee line under that blankie and got right on up there ‘fore someone else could claim the spot! Finally, all 7 of us were settled ’round her and she started the movie. I’m gonna let my Lady tell ya ’bout the movie and it’s importance. All I can say is my Lady sure did hug me a lot while we watched it! She ’bout cut my air clear off holdin’ me so tight! Can I just say that I love dogs?! I live, eat, and breath dogs! Actually, it’s not just dogs, but all animals. I also love movies with animals in them. Is there really anyone that doesn’t? I’m also one of those that can watch a person get hurt or killed, but please don’t hurt the animal! That sends me into a real tail spin! After hearing about Susie’s Hope and the inspiration behind it, I was elated to receive a chance to check it out and tell you about it! Susie’s Hope is so much more than just a movie! It is based on a true story that is inspiration beyond belief! It also led to an important law being passed! Powerful Emotions! Sadness! Anger! Helplessness! Before I go any further, I need to tell you to grab a box full of kleenex before watching this movie! Susie’s Hope provokes powerful emotions ranging from from not only sadness, anger and helplessness but also inspiration and leads you through triumph over tragedy! To be perfectly honest – it hits you right in the feels! I am honored to help spread the powerful message of Susie and all that Susie’s Hope stands for! 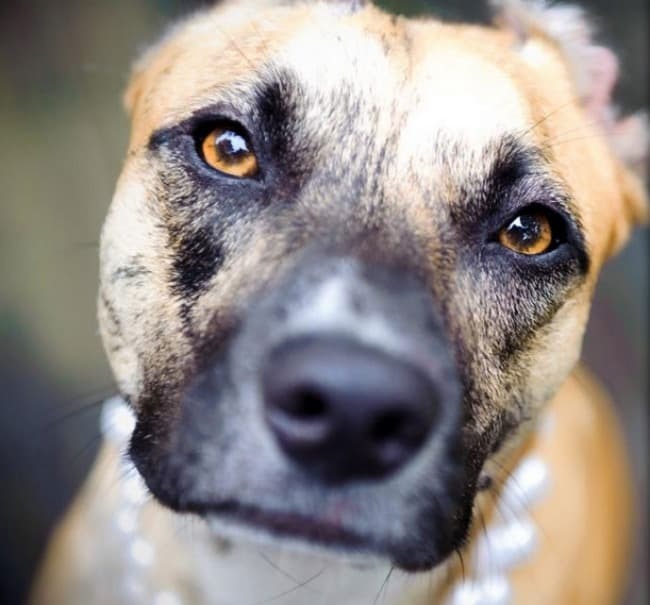 Susie’s Hope follows the inspirational relationship between Donna Lawrence, the survivor of a pit bull attack, and Susie, a pit bull mix puppy found beaten, burned and left for dead in a park. Together, they learn to heal, love and forgive as they lead a historic effort to seek justice and protection for all animals. Donna Lawrence, an expectant first-time mother and animal lover, is horribly mauled by an abandoned bit pull as she attempts to feed him. The accident causes Donna to both lose the pregnancy and her ability to have children. As Donna begins to question God’s purpose for her, she discovers an answer: Susie. Donna finds the puppy on the edge of death, having survived the horror of being doused with lighter fluid and set on fire, her skin scorched and ears burned completely off. Seeing many parallels between herself and the abused animal, Donna adopts the puppy and names her Susie, the name of the child she lost. Donna then partners with a local animal shelter to establish Susie’s Miracle Fund to pay for operations to save Susie’s life. Donna discovers that Susie’s abuser will walk free because North Carolina laws only recognize animals as property. Determined to bring the abuser to justice, Donna and Susie rally the community for a stricter law, later called Susie’s Law, which instates a jail sentence for cruelty to animals. Check out this short clip and I’m sure you will want to see the entire amazing and inspirational movie! While not everyone will be interested in the cast, I wanted to take a moment to introduce the cast and let you know that Susie’s Hope partnered with the American Humane Association and sought out performers who are animal advocates themselves. To me, this adds to the movie because the actors involved truly care about animals! Emmanuelle Vaugier, the film’s lead actress, who organizes the Fluffball fundraiser for Best Friends Animal Society. Jon Provost, who played Timmy in Lassie and won the Humane Society’s Genesis Award for his writing on The New Lassie. Megan Blake, whose Pet Life Radio program A Super Smiley Adventure was recognized by the Genesis Awards and inspired the Super Smiley Flash Mob 4 Pet Adoption. The cast also includes Burgess Jenkins, Andrea Powell, Willette Thompson, Gregory Waller and Lance E. Nichols. A portion of the Susie’s Hope film’s proceeds goes to the American Humane Association, and 15% of the proceeds go to non-profit charities for animal welfare. Susie’s Hope non-profit organization works to educate and promote animal welfare through programs at schools, churches and hospitals, where Susie makes appearances as a certified Therapy Dog. Susie’s Hope is more than just a movie! Susie’s case went on to bring about an important change in the law in the state of North Carolina! On December 1st 2010 “Susie’s Law” went into effect. We hope that “Susie’s Law” will give a voice to the voiceless and see that all neglected animals find justice and receive the care and love they deserve. What a powerful message Susie’s Law sends! How anyone can be so cruel to any animal is beyond me! But, we see it everyday. We need stricter laws and harsher punishments for these heinous crimes! Susie is leading the way and you can’t help but encourage her on! Go Susie!!! Susie’s Hope is a must watch movie! Don’t be afraid of the sadness! 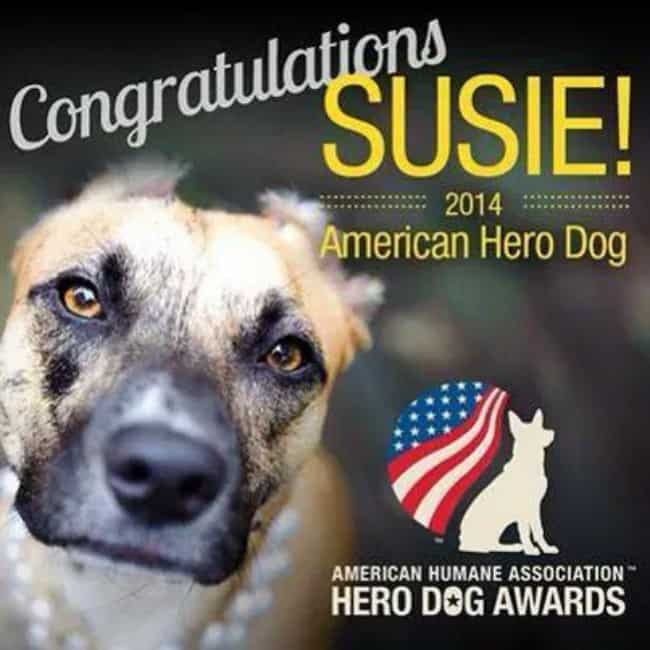 Susie, and her owner, triumphs and goes on to make an important impact with Susie’s Law. You will find yourself rooting for them and rejoicing in every accomplishment they make! Even though I seemed to have cried through the whole movie, my tears of sadness turned to tears of happiness as I felt Susie triumph over the injustice dealt to her! I honestly believe Susie’s Hope is one of the most inspiring movies I have ever seen! See Susie’s Hope on DVD! Susie’s Hope is available for purchase online at SusiesHope.com and on shelves at Best Buy, Walmart, Family Video, Amazon and other national retail outlets. Be a part of the cause! As you already know, animal cruelty has became an epidemic not just in North Carolina but across the nation! If you would like to donate to this wonderful cause and help Susie and their organization continue their educational work, you can make donations at www.SusiesHope.com. One person can make a difference! By each of us pulling together and working as a community we can do this! Who would love to win a copy of this amazing movie? Giveaway ends 1/2/15 at 11:59 pm ET! Open to US residents 18+ and older. I was provided with the product above from Susie’s Hope. No other compensation was received. All thoughts and opinions stated here are 100% my own. Yes, there’s are a lot of groups that have petitions for stopping abuse and cruelty. I definitely am sure that stricter laws need to be passed! My ex-husband got away with 30 days in county after brutally beating my son’s dog with a baseball bat until she was unconscious and then stabbed her repeatedly with a screwdriver until she was dead. He did this because I had asked him for a divorce, and this is how he got back at me. Needless to say, my son was devastated (he was 12 at the time). The judge did what she could under the law, but the laws definitely need to be changed! Very aware- and have had many incidents locally lately that have stirred a support in our community. Yes! I agree that stricter laws need to be passed against animal cruelty. They need more stricter laws to be passed against animal cruelty. My mother-in-law is a volunteer @ rescue shelters! She tells me all her stories!! Yes, there’s are a lot of groups that have petitions. Seeing story after story on the news about animal cruelty cases should make anyone think that the laws need to be stricter. Of course! I think it’s terrible how some animals are treated an abused. Even when it’s freezing out and people leave dog outside food and water it’s not considered abuse. Would you stay out in the freezing cold? I don’t think so. Stricter laws need to be enforced. I don’t understand how people can abuse animals either. We do need stricter laws to punish those who abuse animals. I watched Susie’s Hope and it was every bit the story you described. I joined facebook 4 years ago when my daughter passed to outreach to some of her friends but I have only been really more active for a year and half. I have somehow stumbled on the several different pet rescued sites and was shocked at all the animal abuse…it literally hurts my heart to think of some of the cruel and unthinkable things that happen to animals in many states and agree there should a law passed to prosecute such behavior in every state …people with those kinds of minds need to be stopped .. In my opinion I dont feel like the capability to be so in humane would stop with animals and pets in some cases but should also serve as an alarm of a mental problem that could go a step further to people. It might help prevent crime on the street as i wouldnt doubt that any person that goes that far to torture and brutally beat an animal is calable mentally to do more if provaked in some way. The crime should certainly be punished by law in any case and our family protected whether ,2 legged or 4 legged. I have singed several petitions that have popped up to help put a stop to all this animal cruelty. My heart goes out to our mistrested friends and love ones.